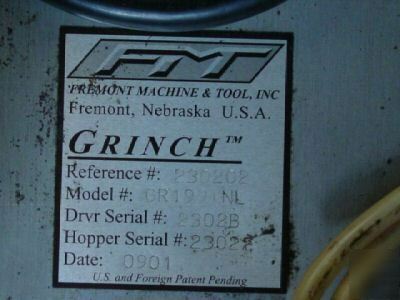 This listing is for a Fremont Machines "The Grinch" christmas tree fastener. 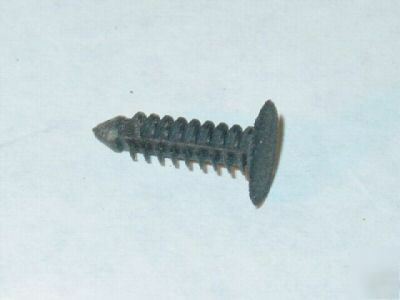 The fasteners size that was used before is 1/2" head x 7/8" long. You might be able to use larger or smaller but you would have to call the manufacture. * Through automated loading and air-powered insertion of "Christmas Tree Fasteners", The Grinch™ saves unnecessary intensive manual labor and time. * Through utilization of a trigger, The Grinch™ frees up an additional hand for upholstery adjustment, making the process easier. * The current awkward process of using fingers and mallets is slow and lends itself to carpal-tunnel syndrome; however, The Grinch™ is fast and does not require strenuous movements. * The Grinch™ ensures secure, consistent placements of "Christmas Tree Fasteners" through automation. 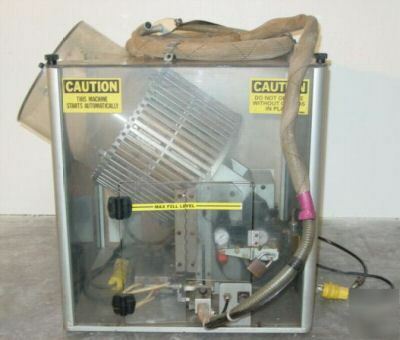 FREMONT, NE - June 7, 1999 - Fremont Machine and Tool (FMT) has launched a new product, The Grinch™, a hand-held air gun that automates the process of securing plastic "Christmas tree" fasteners that are used to assemble products in a variety of industries. The Grinch™, patent pending, works like an air gun. 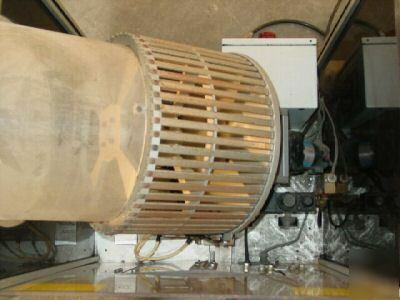 The user empties a box of fasteners into a hopper, which files them through a tube into the gun. 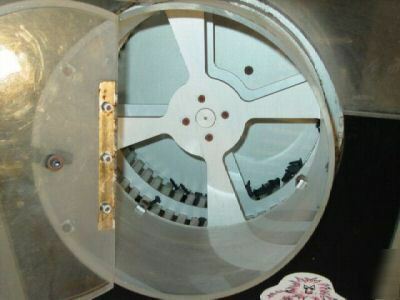 Pulling a trigger shoots the fasteners in, automating what was once a manual process. "The benefits are clear. 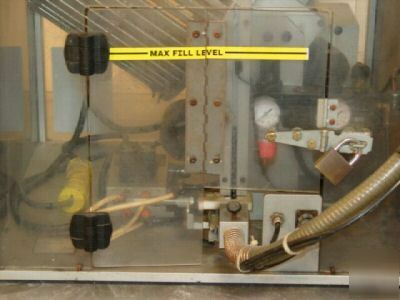 The old method is time and labor intensive, and The Grinch™ shaves off valuable assembly time by doing the job automatically," said Kelly Benes, vice-president of sales and marketing for Fremont Machine and Tool. "Plus you have the added advantage of secure, consistent placements." The Grinch™ comes in different models according to fastener size and can be custom-made to suit any size fastener. It can be used wherever automotive manufacturers use Christmas tree fasteners, whether it's for anchoring upholstery, blanket carpet, door panels or fire blankets under a car's hood. The Grinch™ also can be used in other industries, for example to secure furniture upholstery or to assemble toys, appliances or shelving. The Grinch™ is even smaller and lighter than a typical air nailer, weighing only a few pounds. 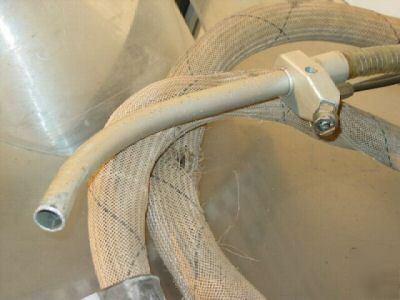 Its handle is comfortable and the product is balanced for operator's comfort. The Grinch's price is based on tooling charges for fastener customization. 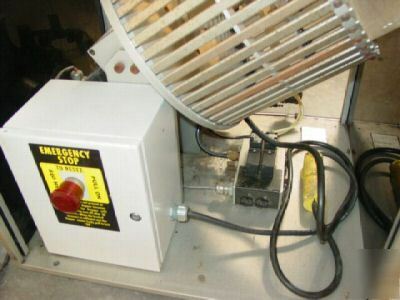 This is used, and in excellent condition. Guaranteed to be working properly. Check out the picture for more information. Feel free to ask any questions. WANT TO REACH ME BY PHONE? Feel free to call me (Trent) toll free @ .